Sweetest baby girl book ever, Can be monogrammed. Girl Baby Memory Book. "She is my Joy". Elephants and giraffes. Baby Photo book. IF you order a matching frame with the Baby Book, be sure to apply the coupon for 10% off. BBFR15. 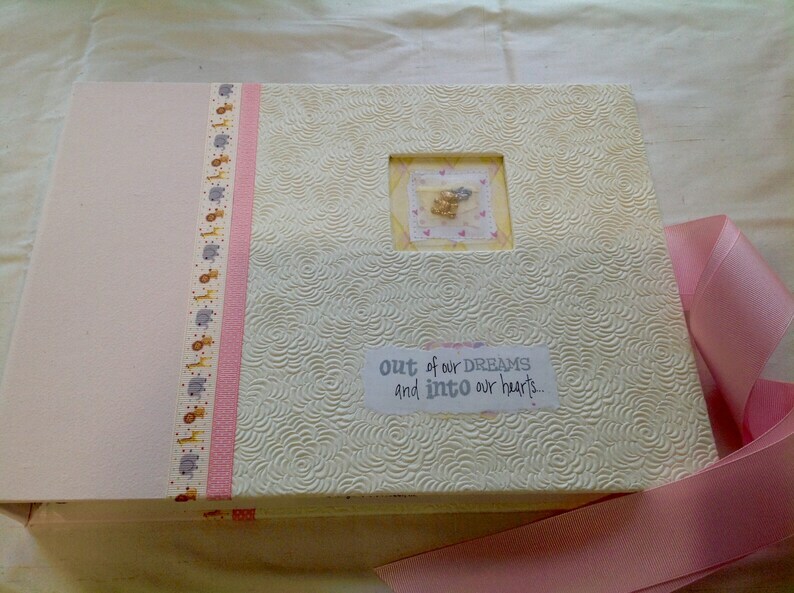 SHE IS OUR JOY, Baby Girl Memory Book, Elephants and Giraffes. Exceptionally high quality handmade baby memory book. This particular book has a soft feminine pink, with a slight luster, on the binding and a beautiful creamy yellow embossed flower paper completes the book. A soft yellow or pink grosgrain closure ribbon matches the accent ribbons of soft yellow and an adorable safari animal print grosgrain ribbon. The charm window uses coordinating papers and the charm is a precious giraffe which you can see in the photos. The quotation reads, "She is my joy and hearts delight," or "Out of our dreams and into our hearts." PICTURE 2 is another option, with the colors reversed. PICTURE 3 shows the photo option. PICTURE 4 shows the monogrammed option. I'd gladly personalize the book, perhaps with the baby's name and birth date. The quote can remain or not. The book measures 9"x12". The papers, charms and ribbons I use are the highest quality. The book itself is made from non-warping fiber board, (not heavy duty cardboard) and I personally put the book together, including the binding and the 3-ring apparatus. Upon completion of the book it is sprayed with an archival varnish to help prevent smudges and stains. 50 pages of 80# lightly flecked card stock are uniquely hand designed, lettered and illustrated, giving you all the prompts you need to remember everything. The pages are NOT computer generated. Each page is blank on the back, providing extra space to easily adhere important photos. Five white bags are interspersed in which to keep cards and memorabilia. Two color appropriate vellum pages are printed with 0-1 year and 1-5 years and provide the designation for photos and memories. The opening page in the baby book is a poem that will most certainly bring glad tears to your eyes upon each read. This baby book is a perfect way to record and journal your baby's first year and beyond. Everything from treasured tidbits of motherly advice to special details of your baby's birth and development can be recorded on these darling hand-written and illustrated pages. Its inclusive. Nothing has been forgotten. If it includes pages you don't wish to record, they can be easily removed, no damage to the book. Reliving these memories, later on, down the road, to this child and to their children is when the benefits are truly reaped. I believe I accomplished my goal with this book, a beautiful completely handmade book to cherish forever. A product that looks clean and artsy without the 'homemade edges'. CUSTOM BOY BABY Book, Memory Book, Nautical Baby Book, Sailboats and Anchors, Blue white and yellow. Baby's monthly progress,photo book. Love it, seller very helpful. So precious!! Looks as described, just precious and high quality. This is a treasure. Beautiful! Thank you so much!! A real pleasure doing business with you. Excellent communication. Second time i have ordered and love jackie’s work!! I accept all major credit cards and also of course Paypal. If you are placing a custom order, it may be necessary to have a paypal acct. so that I can make a separate invoice for you. A full refund will be given, provided the merchandise is returned in the same condition inwhich it was sent and there were no special orders attached to the order. I'm sorry but custom orders are not returnable. I will do whatever I can to make sure you are happy with it but return postage is not paid. Please, if returns are necessary, I will refund the cost of the item, provided it is returned in the same condition inwhich it was sent. The exception to this is special orders, those are not returnable. You are responsible for return shipping. A 10 day return policy please, however I can be flexible with this. Very often my items are completely one of a kind. However I do offer items on my website that are of course produced again. If you'd like to have something custom done to your order, don't hesitate to email and ask. Simple changes like charm choice, personalization of names and dates and quotes can be done at no extra cost. Other changes may require a fee. Baby GIRL MEMORY BOOK. Baby Photo book, Pink and yellow baby girl record memory book, "Love and Sunshine",birth to five years old.. Boy or Girl Nautical Baby Memory Book, UNISEX baby book, Baby's years 0-5.Neuter General Baby Jourrnal. Baby Photo Book. Baby's Keepsakes. BABY BOOK, Baby Girl Memory Book,"Heart's Delight" Pink and green baby girl memory book pictures and journaling. Scrapbook and memory keep.